I tried both variations of Quaker's new Weight Control Oatmeal - cinnamon and banana bread. This was the better of the two. They were both pretty bad. The problem is that they've replaced sugar with other natural sweeteners and the taste has been heavily impacted by the new sweeteners. The initial bites of both products are fine, but as you eat more, you begin to notice a strange taste, more reminiscent of artificial sweeteners. Both products leave you with an unpleasant, almost acidic aftertaste. The banana bread version wins out only because it is more effective in masking the taste of sweetener. As banana flavor goes, this really isn't that bad. There are two banana flavors in our world - real banana flavor and the artificial banana flavor you might associate with Wacky Taffy or Banana Moon Pies. This is definitely closer to real banana. But as good as that might be, it can't hide the strange sweetener flavor that seems to get stronger with each bite. The packaging says that this is an oatmeal "designed to help you meet your goals (of achieving and maintaining a healthy weight)". That's the problem. It tastes more like a breakfast "designed" by a team, than created by a chef. What do you think of Weight Control Banana Bread Oatmeal? It does have a slight aftertaste, but I love the banana bread flavor, and the Weight Control variety is more filling than the standard Quaker Instant Oatmeal packets. Have a feeling these natural flavors are not exactly kosher... bad aftertaste and I couldn't finish my first bowl and I LOVE anything banana... too bad. Why is HEB no longer carrying my favorite oatmeal, Quaker Weight Control Honey Cinnamon Oatmeal or something like that. I have bought other brands trying to replace it, like Hill Country, but yuck! Just a waste of money. 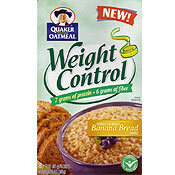 Please bring back Quaker "Weight Control". Would be even better if they sold it by itself instead of the variety pack. 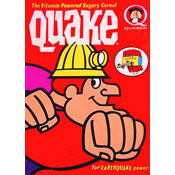 I used to get this box and seriously eat banana bread oatmeal for breakfast lunch and dinner! I'm not a chef so it was quick and easy and so delicious. Needs to make a comeback please. For some reason, the sweetener power seemed to mix with the water into a gooey paste that tasted powdery (I did add enough water) and did not seem to mix with the oats. Taste is decent but it barely makes it down my throat, added more water and it still did not do the trick. You need to make banana bread oatmeal all by itself in a box. I just love it. I eat it every day, but I can't find it. Please. The Banana Nut bread tasted like really bad banana candy... yuck!! Tried the others and they have that yucky after taste. The rest of these are going in the break room for someone who is starving, maybe they will enjoy. This is horrible! I love the banana bread oatmeal. I love the way it tastes and I want to know why it is not sold by itself anymore. I can't find it anywhere. I am like everyone else tied of spend money on a variety pack for just banana bread. I LOVE Quaker Oatmeal Banana BREAD AND CANNOT find it anywhere. Just want BANANA BREAD ONLY!!! Live in NJ. Quaker Weight control Banana Bread is AWESOME!!! PLEASE HELP!!! Yeah, I think they have discontinued carrying this by the box!! I'm so sad, I used to eat it every single morning for breakfast and now I can't find it where I usually do. I used to get it at HEB in Texas, and I think Wal Mart used to carry it too, but now it's just nowhere to be found by the box. :( I hope they didn't discontinue it -- I am also addicted! The Banana nut bread is my very favorite oatmeal and I can not find it by itself, if I want it I have to buy the box with other kinds of oatmeal, which I don't like. Will not spend money to throw away the other packets. Where can I buy this. I live in Oklahoma and have looked at every store. The original review talks about sweeteners as if every gosh dang darn thing being sold in stores now is not packed with this superficial garbage. We're living in a plastic packaging, factory nightmare. This is among my choices for my morning cereal-fix. I've discovered a more-economical way to extend the money I spend on individual-serving size pkgs. I first pour desired amount of regular oatmeal into my bowl; add my flavored oatmeal pouch, add water/milk, stir, put in microwave and zap! I can't notice much difference at all. Certainly less expensive. I like the taste and it's only 2 WW ponits! And I'm not hungry again till lunch! Love it! I eat it for breakfast & lunch. I'm not even hungry for dinner after that!!! Great stuff. This is by far my favorite kind of pre-packaged oatmeal. I tried it side-by-side to the original Banana Bread and found this one to be more full-bodied. Plus, the weight control version keeps me full much longer and leads to a more satisfying meal. I don't taste any artificial flavoring, but then again, I'm used to them. I have been eating the banana-oatmeal for a while. I don't mind artificial sweeteners since I am used to it and I really like the taste of this particular oatmeal. I can have a hearty breakfast at work and feel full for hours. I especially enjoy sprinkling chopped walnuts on it for a real nutritious kick. Today is my first today trying the Quaker weight control oatmeal Banana bread flavor... Its not terrible and its not yummy!! Tomorrow I'm going to try adding milk & maybe a lil sugar to doctor up the taste!! It''s not the best but I'm going to keep eating it! At 3.26 per box I''ll learn to love it!!! Love this product!! It really keeps me full for hours. If you expect this product to taste like regular instant Quaker oats then don't buy it. Tried this oatmeal for the very first time today. Loved it! I just had the banana flavor and I feel like throwing up. The worst thing I have ever eaten. I couldn't even finish it. Totally yucky. I actually disagree completely with this review... I really like this oatmeal. I eat it every morning with a small splash of milk and a banana. It keeps me full until lunch with no problem. It's perfect for something quick and easy to make in the office so that I actually get to eat breakfast. I love the Banana Bread flavor. Not too crazy about the cinnamon or the maple syrup ones though. I usually add a packet of splenda and it tastes great. I have a bowl every single morning. I liked it when I added a teaspoon of sugar to it. Was looking to replace the Oatmeal To Go (Banana Bread), and this is a real good choice that I had! I didn't care for this oatmeal, which made me sad because I love the other flavored Quaker Oatmeals. It smelled good, but had a very acidic taste too it, and it didn't work with helping to curb hunger at all. I don't understand how it was supposed to be a weight control oatmeal aside from being slightly healthier. I'm more satisfied after eating a regular bowl of plain oatmeal. I still have almost a whole box of this stuff left. It tasted like oatmeal, simply put. Just the same as all of quakers other oatmeals just a lot better for you in general. I didn't notice that artificial taste at all. I actually really like this product. But some people notice artificial sweeteners in things like diet soda and I don't so that's probably the difference. I was disappointed to see this item no longer available in any of my stores. I really did like it and the portion size was perfect - a little larger than the normal Quaker oatmeal packets but not as large as two regular packets. It was just right. Oh well.